Published in French and penned by Françoise Hardy herself, the original title of her memoir is “LE DESESPOIR DES SINGES ET AUTRES BAGATE.” After being translated into Spanish, Italian, and German, she has sold millions of copies since the original 2009 release. I expect that number to grow much higher with the new English edition being premiered this month, fully translated by Jon E. Graham. Cover of Françoise Hardy’s debut studio album “Tous Les Garçons Et Les Filles” released in 1962. Ms. Hardy has had a supremely interesting life, starting right at birth, when she was born during an air raid alert in 1944. Her hometown of Paris was being controlled by Nazi Germany until about eight months later during the Invasion of Normandy, a 6 day military action that led to the Liberation of Paris. In that first month from birth, her mother did not answer her cries with comfort, but by ignoring her. Françoise eventually stopped crying out at all. Within the first paragraph of her memoir she says, “Today I believe what I understood was this: the more you cry out, the more you are ignored. You must hold your tears back and never ask anything of anyone.” This drew me right into her story from the very beginning. In the first chapter alone, we learn about many of the relationships Ms. Hardy had with her family, and realize that our own family problems might not be so bad. Her sister told her in their twenties that she had been afraid of their mother, who was very strict and almost bitter, but “[Ms. Hardy] was the first person for whom she had ever felt deeply.” Ms. Hardy and sister Michéle never connected during childhood due to Françoise’s desire to keep their mother for herself. After all, she didn’t have positive relationships with her father or grandparents. Her father came around once in a blue moon, and although visits were enjoyable, she suffered anxiety during the days leading up. Her grandmother displayed massive hostility towards men, which caused her grandfather to become isolated and silent, only speaking to Ms. Hardy once when she was eighteen. On top of her grandmother’s hostility, was an immense sarcasm and a knack for hurtful comments about Ms. Hardy’s looks. “…I grew up convinced I was more ugly than average.” If you’ve ever seen Françoise Hardy, you would know that is obviously not true. She spent her entire life feeling ashamed of her looks and found different ways to cover herself. To this day, she is cognizant of wandering eyes around her. Michéle would see how Françoise would react to her grandmother and used it to her advantage. Ms. Hardy considered it emotional blackmail and still gets upset when anything similar to that arises. Photos by Jean-Marie Perier during the 1960’s, making Françoise Hardy a fashion icon. Skipping ahead to her mid-twenties, she recorded a song at CBE Studio with director Bernard Estardy, who according to her was such a great sound mixer that it felt magical. This all came about when a producer invited her to listen to some songs, where she didn’t feel even slightly attached to any of them. She decided on one and took it home to listen, which is where the connection occurred. Eventually, she had lyrics from famed Serge Gainsbourg and producer Jean-Pierre Sabar on her team. While recording ” Comment te dire adieu?”, she says that it “was the first time I had felt so much pleasure and ease when singing. She recorded at CBE for about five years. She goes on to talk about experiences such as being a jury member for an annual song festival in Rio with Paul Simon, her experience with pregnancy, and the death of a confidant. Instead of giving away too much more of her life events, ups and downs, and successes, I suggest getting your own copy today! At age 74, Françoise Hardy is still an icon and an inspiration to millions in music and fashion. 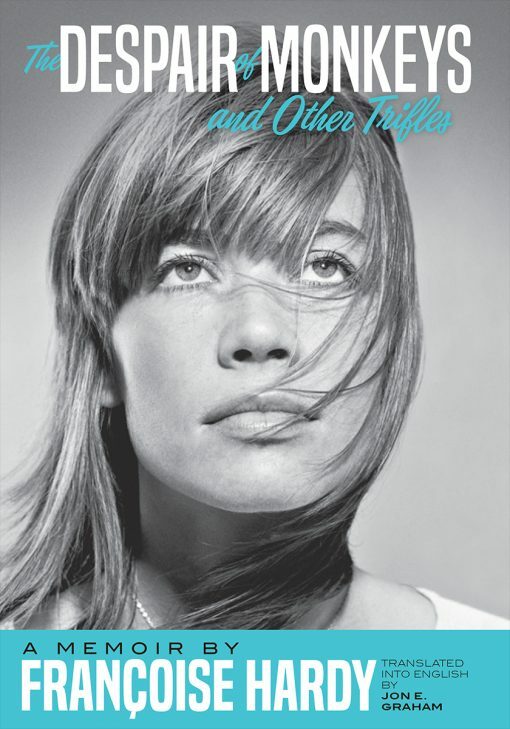 Françoise Hardy’s memoir is beyond inspirational. There is so much truth to everything she has written and it doesn’t feel like a historical nonfiction like many biographies end up. I definitely suggest giving this a read, especially if you are a fan of Ms. Hardy or her music. You will have such a deeper connection to her when you read about her upbringing and developed success. Not sold enough on this one? Check out last year’s trailer for the book HERE! The translated memoir can be purchased locally at Joseph Fox Bookshop. However, if you are French-speaking, Joseph Fox has the French edition as well, published in 2009. Next Product Review: Did we go nuts for Milkadamia?